Kirstie Foweraker has just got the call to go to Dover! As long as the weather forecast holds up, her Aspire Channel Relay team should set off from Samphire Hoe near to Dover to swim to France at 7pm tomorrow. I’m going to be joining a relay team, with 5 others, and swimming the 21 miles to France. 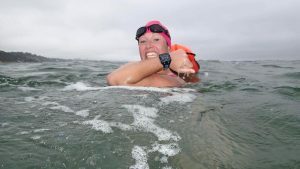 This isn’t just any 21 miles, this is 21 miles in cold, deep, tidal, open water with jellyfish, dolphins, sea weed and other things I would care not to think of! To make things that bit harder, channel swimming rules dictate that you can’t wear a wetsuit, gloves, booties or any neoprene of any description. Only 1 standard swim suit, 1 standard swim hat and 1 pair of goggles is permitted. Kirstie is raising funds for Aspire, an incredible charity that helps people trying to rebuild their lives following spinal cord injury. Every eight hours someone is paralysed by a spinal cord injury. Working in a specialist ICU in a busy, trauma hospital it’s part of Kirstie’s role to look after people in the very acute phase following spinal cord injury. She knows all too well how devastating an injury is and how this acute phase is only the tip of the iceberg for those affected. As well well as wanting to raise money for Aspire, a Channel relay is a massive personal challenge. Kirstie is relatively new to the cold and waves of sea swimming but she’s overcome her fears and trained hard for the Channel Relay. She’s had great support from members of East Dorset Open Water Swimming Club and also from Beyond the Blue at Shore Road. But at the end of the day she’s got there herself and is ready and raring to go. Please show your support by sponsoring Kirstie and helping her raise loads of money for this incredible charity.